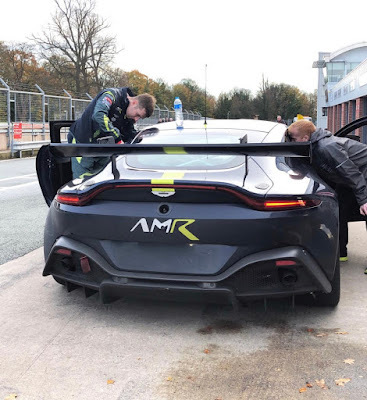 Home > Academy, Aston Martin Racing, British GT, nicholl-jones, optimum, Oulton Park, RL, Testing, TF Sport, Vantage GT3, Vantage GT4 > First customer tests for new AMR Vantage GT4? First customer tests for new AMR Vantage GT4? Today may have seen the first customer tests with the new Aston Martin Racing V8 Vantage GT4 at Oulton Park as the new race car reaches its final stages of development ahead of its formal homologation early next year. With three British GT race teams being announced as holding the first batch of orders for both new platforms at the final round of the national championship back in September - two such teams (TF Sport and Optimum Motorsport) have since gone on to announce a part driver line up for at least one of their new GT4 cars for British GT in 2019. Academy Motorsport (the other remaining team announced to receive early examples of the new GT4) were of course also the first team to secure their team name across the side of an actual example of the new car back at Donington Park. Today we understand was theirs (and others) first on track experience of the new car with a number of potential drivers present. Both the new GT3 and GT4 Vantage recently underwent an extensive endurance test at the Paul Ricard circuit in southern France earlier this month with most of the factory teams GTE Pro driver line up. The new GT3 has already under gone a number of customer tests around the country to present the factory team and Prodrive with a very healthy order book for both platforms. A great insight into the development of both the GT3 and GT4 cars can be found in this Dailysportscar.com piece HERE.